Raymond Jordy was born in Limoux (Aude) on 22 June 1914. He did his officer cadet training at Saint-Maixent in 1936 and stayed in the army as a reserve officer on active duty with the rank of 2nd Lieutenant. 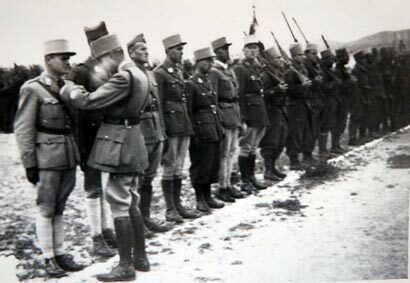 In 1939 he joined the Tunisian 24th Rifle Regiment in la Roche-sur-Yon (Vendée). He served in the French Campaign with the Tunisian 24th Rifle Regiment and was wounded in both arms. His conduct during the fighting in the Mormal Forest having won him a mention in dispatches first by his division, and later by the army, he was made a Knight of the Legion of Honour in 1941. On leaving hospital in Bordeaux, scarcely recovered from his injury, he rejoined the African Army and his regiment, the Tunisian 4th Rifle Regiment, in December 1940. After the American landings in North Africa in November 1942, he served in the Tunisian campaign in 1942/43 where his conduct as company commanding officer during the fighting at Ragoubet El Mora won him a mention in dispatches. He was decorated with the Military Cross with three bars. Before embarking for Naples in December 1943, he was a Lieutenant, and the only company commanding officer to have been decorated with the Legion of Honour. Aged 29, he was the youngest officer of the 4th R.T.T., and commanding officer of the 11th Company of 185 men, attached to the 3rd Battalion, which was commanded by Major Gandoet. Gandoet, who took command of the 3rd Battalion in May 1943, had soon noticed in Jordy for “his personal courage, his qualities of leadership, his professionalism, his good humour and his skill in waging war“. Gandoet acknowledged in his private correspondence that it was for these reasons that he had chosen the 11th Company to break through the Gustav Line. The role of Jordy and of the 11th Company was central to the fighting at Belvedere. It was Jordy who received the order to lead the main offensive and to take hills 681 and 862, thereby breaking through the Gustav Line. For the Allies, breaching the Gustav Line to the north would oblige the Germans to concentrate their forces on the gap in the Belvedere massif and constituted a diversionary manœuvre, as distinct from the direct attack on Cassino. Having crossed the hamlet of Olivella, the 11th Company, carrying very heavy loads, had to enter the “Gandoet Ravine”. The 11th Company achieved its first objective on 25 January, then resumed its ascent the following day, 26 January, and to the surprise of the Germans, succeeded in taking the second objective, hill 862, at 7.00 p.m., after unusually intense fighting. Jordy received the order to hold his position when supplies of ammunition were very low and the Germans were organizing a massive counter-attack on the morning of 27 January. I can’t go on anymore, I can’t hold out, we’re almost totally surrounded, out of ammunition. The 11th Company was gradually cut down, until there were only 35 survivors. At 12.40 p.m., Jordy received Gandoet’s order to withdraw. He returned, infuriated, the last of all his men, with nine prisoners. On 28 January, Gandoet gave the order to what remained of the 11th Company to retake hill 862 with artillery support. 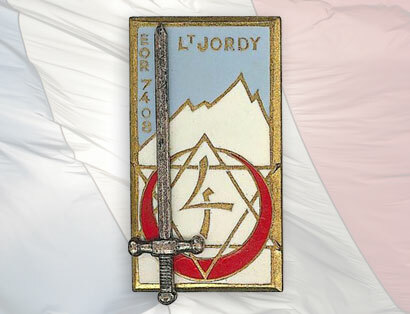 During the French counter-attack on 29 January, in a state of exhaustion, Jordy took part in recapturing hill 862. Gandoet was worried at that time about the loss of his principal officers and in order to mitigate the impact of his own death, should it occur, he asked Jordy on 29 January to stay close to him in order to pass the command of the 3rd Battalion to him if he were to die. However it was Jordy who, on 4 February 1944, the day on which the 4th R.T.T. was relieved by the 3rd R.T.A., was killed by two shells fired from Cifalco, as he was coming down the Belvedere with Gandoet. Colonel Lagrange has given an unpublished account of this day under the heading “The Relief of Belvedere, 4 February 1944” on this site. Raymond Jordy was buried on 6 February 1944 with Loretti, the ambulance driver, and was entitled to a personal speech from General Juin who said that Jordy was one of the most brilliant officers involved in the fighting at Belvedere. When he became a Marshal, Juin paid tribute to him again in his memoirs, most notably by saying that the death, on the last day of the fighting, of “the man who used the Gandoet Ravine” symbolized the deaths of all the martyrs of the 4 th R.T.T. Jordy has a lasting place in the history of the Italian campaign as the first Allied officer to have broken through the Gustav Line, which Clark’s British-American army had not been able to do ten days earlier. The officer cadet class of 74/08 bears his name.